16.5 inch Mosaic Damascus double edged blade. Premium fossle walrus ivory handle. Stainless steel fittings with Kyle Royer engraving and 24K yellow and 18K rose gold inlays. Kyle Royer sheath with shark and gator. Don’t forget to check out the wedge pillow, for a great nigh sleep. 4” Wharncliffe blade of tight W twist damascus. Stainless steel Kyle Royer engraved spacer. German silver file worked spacers and pins. 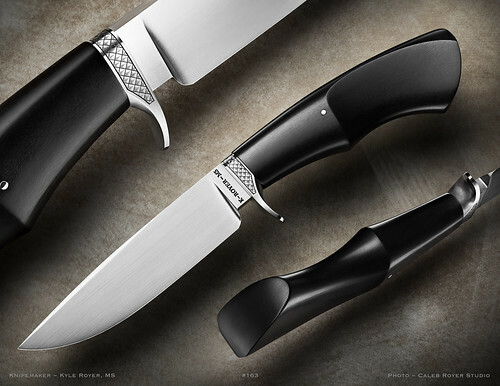 Black Beauty Fighter: This Fighter bas been coined Black Beauty Fighter for it’s eloquent, black flowing lines, sculpted handle, accented bronze and engraving. Blade: 5160 High Carbon Steel, 12 inches in Length, Gun-Blued with Shiny Spine, Clip and Blade Edge. Fittings: Mild Steel with Bronze Accent Spacers. 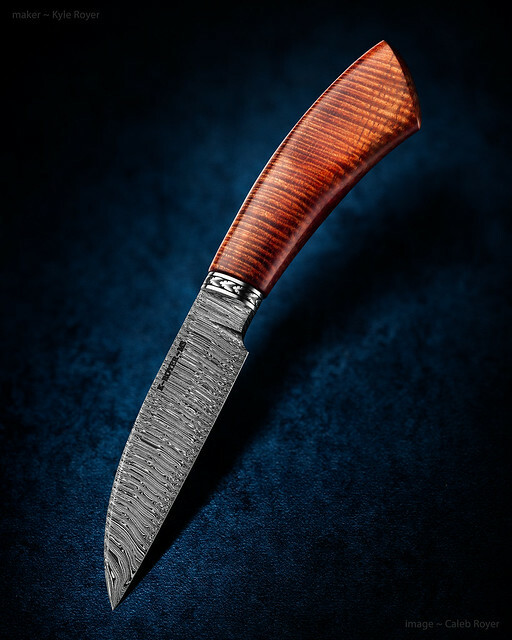 Handle: 5 3/8 inch African Blackwood Handle. Engraving: Kyle Royer French Greyed, Running Wheat Engraving on the Guard, Spacer and Pommel. Sheath: Kyle Royer Tooled Leather Sheath with Gator Skin Overlay. Overall: Length is 17 3/8 Inches. 10 1/2 inch feather pattern blade with sharpened clip. Mammoth ivory handle with domed pins. Coined titanium liners. Frame handle with feather pattern fittings. Handmade K~ROYER sheath with gator skin and tooling.